A now-pulled Best Buy product listing indicates that Motorola’s least expensive smartphone may be getting an update soon. 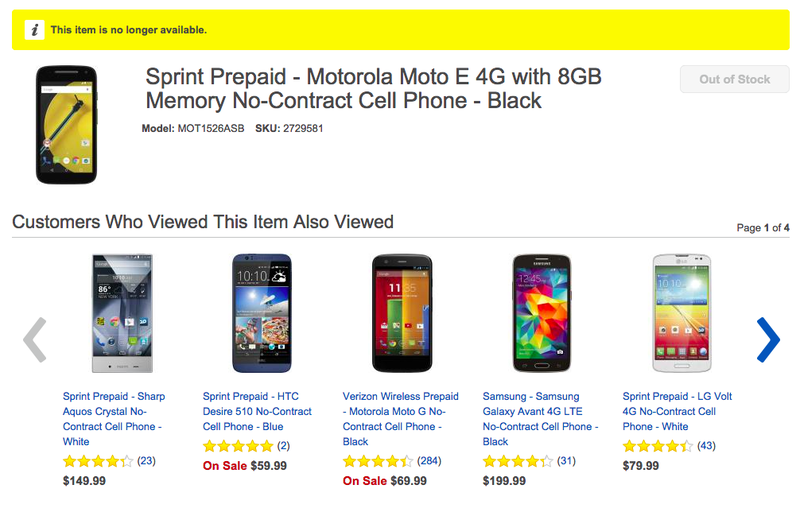 The page listed a new Moto E for Sprint’s prepaid service sporting upgrades over last year’s impressive Moto E, including an LTE modem, double the storage at 8GB, and most importantly, what looks like a price cut from $129 to $99.99 without a contract. Android Police was able to catch the product page and specs before Best Buy pulled them, and it looks like this new Moto E will retain its 4.5-inch 540 x 960 screen, as well as a 1.2GHz Qualcomm processor (probably the Snapdragon 200 like its predecessor). Although Motorola’s high-end phones, like the Moto X or Nexus 6, get most of the marketing attention in the United States and Europe, Motorola’s low-cost devices are important to the company as it breaks into markets like India and, more recently, China. Sales of the Moto E and its slightly more expensive sibling, the Moto G, helped propel Motorola to three million devices sold in India last year, and certainly helped contribute to Motorola’s revenue, which more than doubled in 2014. For me, it’s the LTE support that’s exciting — there are a plethora of low-cost Android devices, but LTE support becomes rarer in the sub-$100 range. In fact, Motorola launched a second version of the the slightly more expensive Moto G last year, but still hasn’t officially launched a version with LTE. Because the listing is for a Sprint handset, there’s a possibility this specific device won’t work on certain GSM networks, like those operated in the United States by AT&T and T-Mobile. But considering the Moto E will be sold widely and internationally when it officially launches, there’s a good chance Motorola will release a version of the $100 phone that will work on your preferred network.